I don’t feel like I’m at my best right now. This is one of those days where I don’t just have a target on my back – I’m wearing one like a sandwich board. And though I’m rolling in waves of insult and injury, a still, small voice is pleading with me somewhere deep inside my heart, telling me to ride out the storm, fight the panic of insecurity and offense, and anchor myself to the only One Who can give me a right response to all that seems so wrong. In I Samuel 30, David is a wronged man who has chosen the wrong place to ride out injustice. After sneaking into the Israelite camp and stealing the two items closest to Saul’s sleeping head (I Samuel 26:9-12), David delivers a wake-up call from a safe distance, holding up Saul’s spear to show the king that he has once again spared his life (I Samuel 26:17-25). But although he momentarily humbled Saul with his refusal to touch the Lord’s anointed, THIS anointed guy wasn’t taking any more chances. Panic strikes David, and rather than going to God, he goes his own way (Proverbs 21:2, Isaiah 53:6, Jeremiah 17:10, Galatians 3:3). Fueled by fear, David runs to the one place where he knows Saul won’t dare to follow – Philistine territory (I Samuel 27:1-4). There David aligns himself with Achish, the King of Gath (homeland of the long-dead giant, Goliath), becoming mercenary and bodyguard to this Philistine warlord. It’s all just so wrong, and it gets even more wrong. By the end of I Samuel 27, David has completed a series of bloody missions to prove his loyalty over the course of 16 months, and when the Philistine lords gather to attack Israel (I Samuel 29), David is eager to enlist. But even the other Philistines know that David is not where he belongs. Finally, in I Samuel 30, David and his men ride out to join the fight, leaving their wives and children behind in Ziklag. Amalekites quickly seize the opportunity to raid Ziklag, burn it to the ground, and carry away all the women and children. David and his men return to total devastation, and faced with the loss of their families, the men turn on David. Their near-mutiny is the lowest rung on the ladder to rock bottom, and David’s heart is finally turned back to God. Instead of forging ahead on emotion, David at last encourages himself in the Lord. He asks God if he should pursue the Amalekites, and with God’s blessing, the families are rescued without a scratch on them. Let me share with you the words that I need to hear – David had every right to be upset, but he had every reason to trust God. Saul was completely out of line and completely off his rocker, but God had more than proven Himself faithful to David. The lion, the bear, the giant, and the anointing – all of these were promises that God had no intention of leaving David. But David had chosen hysteria over history, and he did not consult God before consorting with the Philistines. 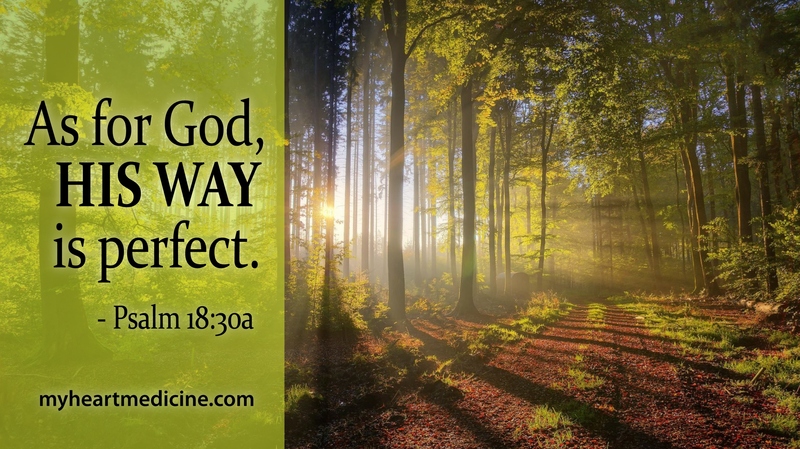 Secondly, God’s way is perfect, but the perfect way is also the perfecting way. It is not perfect in the sense that nothing ever goes wrong and everything happens without a hitch on our timetable. Rather, all the detours, all the delays, and all the distress serve God’s purpose in God’s timing to grow us, train us, and perfect everything that concerns us (Psalm 138:8, John 16:33, Romans 8:28,35, I Peter 5:10, I John 2:5). And in a fallen world, some of that perfecting will inevitably involve injustice and offense. We simply have to give it to God. So today, my feet are planted and my eyes are fixed on God’s way. I have an intense awareness that MY way will only worsen the situation, and history reminds me that my God has defended me and delivered me out of trouble before (Deuteronomy 32:4, Psalm 18:30, 34:19, 40:5, 66, I Peter 1:7, 4:12). The fight is His, so that the glory will be His, and this imperfect woman is praying for the strength to follow God’s perfect way. Have you suffered injury or offense at the hands of someone else? Are you allowing that offense to pull you away from God and His perfect way for you? If so, give it to God, and get back on track. He is your Deliverer and your Defender, and His way IS perfect.